A well-built home has many components that happen in places you may never see. The foundation is the core of the home and can make all the difference between a well-built home and a poorly constructed one. Building a secure home takes advance planning of things that your home might encounter, like high winds and cold temperatures. 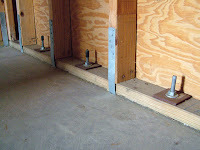 Once the foundation is laid, anchor bolts are put down to securely hold the foundation in place. Anchor bolts themselves are used to attach objects or structures to concrete. They are an essential component to a secure fit on the foundation. The anchor bolts are firmly secured with a treated plate and usually put directly into the concrete slab while it is still wet. Once dried, these bolts will be solid into the foundation. 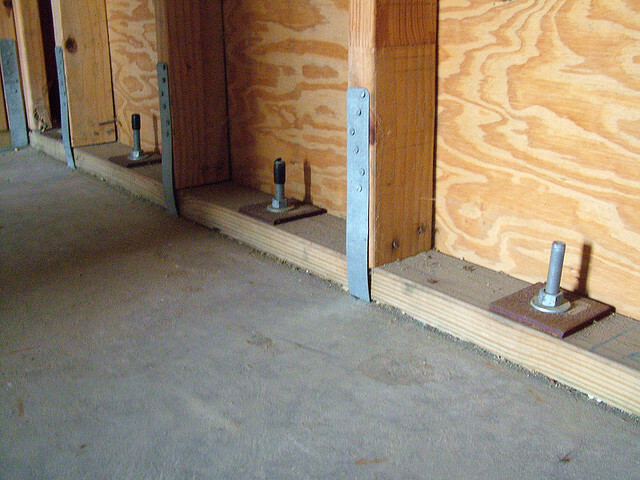 Frequently, local building codes will determine exactly where these anchor bolts must be located. Once the foundation is bolted down, a plate is put up and then the studs. The vertical studs hold the roof up and the second floor, if there is one. Then wind braces are put in to protect the home and the foundation for intense weather that might threaten the security of your home’s foundation. Wind braces are diagonal braces used to tie the rafters of a roof together and prevent racking. Many builders leave this important step out to save time and money but it is an essential component of a well-built, secure home. The wind braces are structural members that stiffen the structure against the forces of the wind. They can be timber or metal, strut, or a tie. The best way to build a wind brace is from wood. The process is to cut it into the vertical two by four studs and nailing the wind brace directly to the wall. The brace prevents racking or any other type of shifting the home might be prone to due to high winds or other unexpected weather. Once the wind brace is in place, the builder can then put a foam board over the top of all the wood. It creates a thermal barrier. This barrier prevents the cold from coming through the ply wood, through the two by fours, then through the dry wall, and ultimately into your home. This provides a thermal break in your home. This foam board is not standard with many buyers but it is crucial to a well-built home. There are many important components to a well-built home. A few that are crucial to the building process are put directly into the frame of the home. They protect from the home shifting and being impacted by unexpected weather.